2. If this isn’t your first studio– tell us about some the other work spaces you’ve had– what worked and what didn’t. How does your physical space influence your work? This is my seventh studio away from home. Having a space I can that I can leave is paramount. Leaving projects out, in mid-process, allows me the opportunity to work on more than one thing at a time. Originally my studios were wherever I was doing the work (school, classroom, etc.) My first undergraduate degree was a double major in photography and ceramics and after graduation I taught photography to children and adults. I also taught ceramics for a while, but I gave it up as I hated having my hands feel so dry all the time. Returning to school and getting an art education degree seemed like a logical step, but after one semester I bailed and moved to the fibers department after meeting the department head while I was working at the Univ. of Oregon’s art library. At that time no MFA at the University of Oregon was offered, so I got a second BFA. Upon graduating (again) I did a lot of weaving – receiving several commissions (weaving a “bajillion” yards of upholstery fabric for an attorney’s office and a series of five tapestries for a bank). With another weaver, I helped start a cooperative studio in Eugene. We rented an enormous open loft in a warehouse situated above a spice factory, near the train tracks. To pay the rent I made other items – mainly elaborated-pieced silk and cotton wallets, covered with ribbon and embellished with antique buttons. This path started when I’d purchased a handmade wallet at a holiday show, but it was so poorly constructed that the contents fell out when the wallet was open. “I can make this better” was my immediate reaction and I decided to create an improved version. I didn’t know much about sewing, or the whole “right sides together” thing, so I covered the raw edges of the seams with ribbon. A business making and selling those wallets all around the country was the result, but I didn’t know how to take that business to the next level, so I moved on. For me, it’s all about the making. How to make it, how to make it better and learning from the process. Upon moving to Washington, DC, for my husband’s job, I fell back on my cooking skills for work and was employed as a pastry chef. On the side, I’d been designing T-shirts for a Eugene charity for several years and wanted to learn the “correct” way to create the artwork for press so I took a class called “Design for Camera-Ready Mechanicals.” The instructor set me up with a friend of his who was a Creative Director at a large DC PR firm, who hired me as a freelancer and then later moved me to the position of art director. I worked on a wide variety of projects including: the first Food Pyramid, the renovation and re-opening of Union Station, the Walt-Disney/Amtrak golf tournament (got to design a traveling miniature golf course). It was a wonderful learning environment. In 1990, we moved to Seattle, with our two-year-old daughter and I really wanted to work from home. I started painting kids furniture, which was sold at galleries and at Best of the Northwest. Re-designing their marketing materials subsequently led me back to graphic design. Through a series of random circumstances I ended up designing custom invitations for all sorts of Seattle events, but my fascination with fabric continued as well. We built a studio behind our house and I worked there until we down-sized when our daughter went to college. Then I rented at the ActivSpace building in Ballard, which is where I was during the studio tour that was part of the SDA symposium last spring. 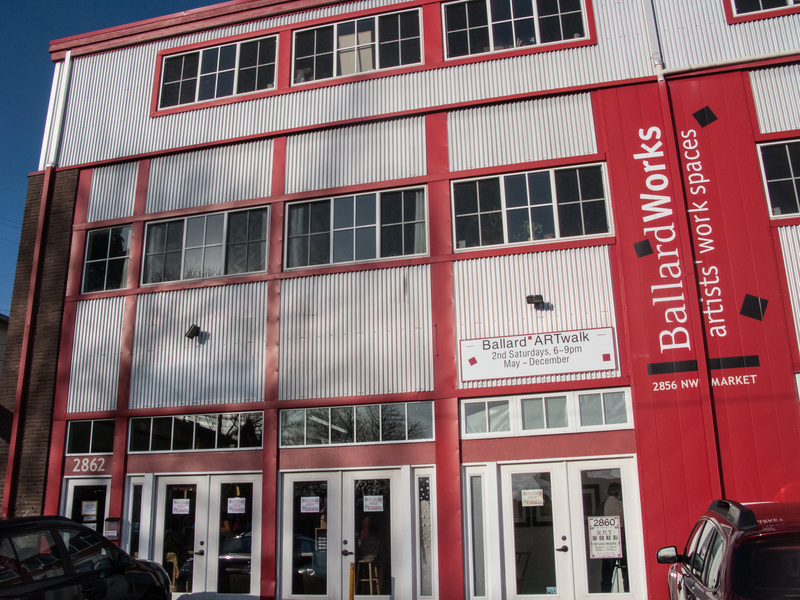 During that studio tour, I came here, to the BallardWorks building, and I wanted to move in immediately! The place I was in was roomy, and had nice western light, but it was isolating. 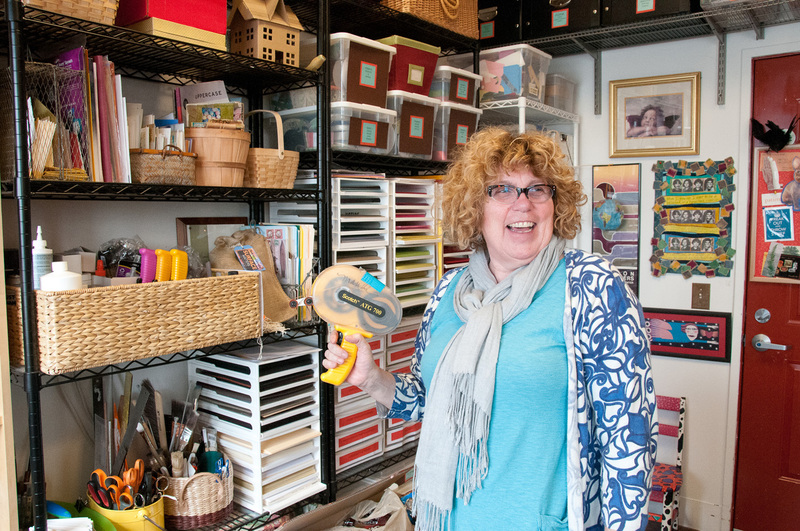 This studio is much more social—there’s activity outside—it’s just more interesting. It’s inspiring to be around other creative people. I didn’t know Leah Adams that well when we decided to take the plunge and rent a studio together. We have very complementary skills and we brainstorm and bounce a lot of ideas off each other. She is helping me learn Etsy and I designed the labels for the felt coasters she makes. We have somewhat different hours, so we both have time alone as well as time together in the studio. When people come in, they usually ask “where’s your space?” but it’s really a shared space. We both have work tables, but the bookshelves I brought have both our books, the storage shelves have both our stuff. We are respectful of each other and we are both willing to share, so it’s been pretty seamless. 3. Do you have a favorite piece of equipment or technique for keeping your studio organized? I create packages of components and spare parts from different projects called “My Trash Becomes Your Treasure.” I sell these at studio sales and other events. Because I don’t like to repeat myself with my custom invitations, I don’t save them for new client projects. My hands are my most important tools. They enable me to make stuff. As for conventional tools, I couldn’t live without my tape guns—I have three of them. I was using double-stick tape on a roll, and before that, spray mount. Such a huge improvement! 4. 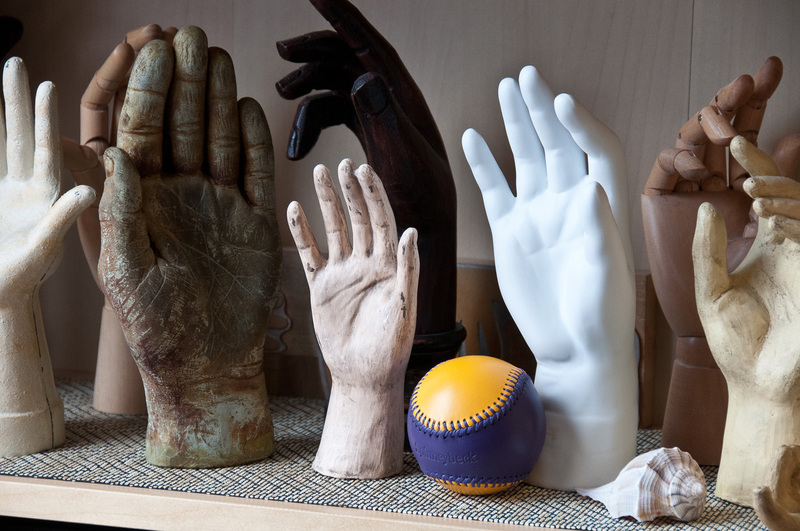 Do you have particular habits that you think support your art practice? I like to go around and look at stuff—seeing what people are doing in stores and other places. It’s not about art specifically, just about tracking what’s going on in the world. I am a huge reader of newspapers, New York Times and others, and I’ll read about what’s happening in a lot of different mediums. It’s about gathering visual inspiration. For example, I belong to a group that makes postcards and mails them to each other, so I went to a Mail Art expo recently. There are these weird little niches you’d never know about— like people who make their own stamps. I often work small, so that was inspiring, to see what others create at that scale. 5. What is the best art tip you’ve ever received (or discovered)? I once took a class on colored pencil drawing and the instructor taught me how to sharpen a pencil (Really! How to do it without ending up with just a stub), and how to choose colored pencils. Here’s the tip: Never buy the whole set. Look at the end of each one, and buy the pencils where the lead is the most centered. 6. What inspires you to work and how do you keep motivated when things get tough in the studio? It’s the process of figuring out HOW to create something that drives me. I DO like making multiples—this may come from making invitations, but I don’t like to actually repeat myself from project to project. Recently I’ve started incorporating collage into my invitation designs and my clients have been very receptive. So now I’ve got a new direction – one that is bringing everything full circle. How cool is that? To see Maude’s work online, go to http://www.maudemakesart.com. To see it in person, check out the Ballard Art Walk, May – December, the second Saturday of each month. This entry was posted in Member Spotlight and tagged Ballard Art Walk, Leah Adams, Maude May. This explains a few things for me, you are a Renaissance woman my friend, with a highly creative spirit. What an adventure you have had, even less linear than mine. I hope our paths cross again, I look forward to that.